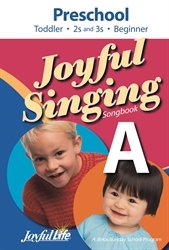 All songs for Toddler, 2s and 3s, and Beginner are in the Joyful Life Singing A Songbook. The songbook contains music and words for songs, choruses, and hymns of the faith. Included are current songs as well as favorites from our Christian heritage.